Haute Living Co-publisher and Haute Time curator Seth Semilof takes a break with Maximilian Büsser to explore the celebrated watch connoisseur’s most innovative pieces for Maximilian Büsser & Friends. Haute Time, the ultimate resource for luxury timepiece aficionados, is flooded with new content from Basel World 2012. 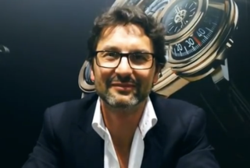 Amongst the many blog postings and fresh images is an exclusive interview with watch industry heavyweight Maximilian Büsser. Haute Living Co-publisher and Haute Time curator Seth Semilof met with Büsser to get an up-close and personal look at the innovative limited-edition machines by his brand, Maximilian Büsser & Friends (MB&F). He then moved on to arguably the most innovative and truly cool watches on the market, the Thunderbolt and the Frog. The Thunderbolt boasts a World War II pinup feature and two crowns—one that winds the engine up and another that changes the time. In the Frog, “you’ve got domes of aluminium turning under domes of sapphire,” said Büsser. Inspired by Tim Burton and Büsser’s childhood, it has a movement of 380-plus components and is only made in 10-12 pieces a year. Gaining an inside look at the industry’s star timepieces directly from the company CEOs demonstrates the respect and passion Haute Time reserves for luxury watches and their corresponding brands. Access Büsser’s full tour of exquisite timepieces and explore the many wonders of Basel World 2012 at http://www.HauteTime.com.